Youth was served today in Cincinnati as the Bengals won their second straight with a 34-20 destruction of the San Diego Chargers at a snowy, sparsely populated Paul Brown Stadium. The Bengals hung 34 points on the league’s number 1 defense, while holding the league’s number 1 offense to just 20, with 7 of those coming in garbage time with the game already decided. The loss was San Diego’s first on the road in the month of December since 2006, and it eliminated them from any chance for a playoff berth. One day shy of his 31st birthday, Carson Palmer put on a spectacular show in a swirly, snowy wind, going an efficient 16 for 21 for 269 yards, 4 touchdowns, no interceptions and a 157.2 quarterback rating. Palmer’s critics will be re-evaluating him after that performance, particularly since he did it without the so-called superheroes that were meant to rescue him and the offense. With Terrell Owens out for the year and Chad Ochocinco inactive with an ankle injury, Palmer was razor sharp throwing to youngsters and back-ups. It was enough to make this Bengals observer wonder what the team’s record would be, and what Palmer’s stats would be had Batman and Robin got injured in week 5 instead of week 15. All over the field, next generation Bengals were shining. Jerome Simpson. Jermaine Gresham. Jordan Shipley. Carlos Dunlap. Geno Atkins. Bernard Scott. Rey Maualuga. Throughout the game, new names made huge contributions. Simpson started in place of the Ocho, and in his first career start he recorded 6 receptions for 124 yards and two touchdowns, one a 10-yard red zone catch, the other a huge 59-yard bomb that caught the Chargers napping, and was reminiscent of the glory days of the Bengals offense. Gresham had four catches for 56 yards and a 3-yard touchdown in which he fought off an interfering Charger DB to secure the ball and tiptoe inside the back of the endzone. Shipley muscled into the endzone on another 3-yard laser from Palmer, and recovered San Diego’s desperation on-sides kick in the closing minutes. Dunlap recorded his 8th sack of the season and pressured Philip Rivers all game. Atkins brought pressure up the middle and got a huge pass deflection on 4rd down. Scott was excellent in kick return game, and scored his first rushing touchdown from 10-yards out to ice the game. Maualuga picked off Rivers and set up a Bengal touchdown drive with his 47 yard return. From the start, the Bengals seized control of the game, with solid play and unflinching performances on both sides of the ball. It started well for Cincy when the Chargers fumbled on their very first offensive snap, causing their opening drive to stall on a 4th-and-22 punt that went a mere 24 yards off the side of punter Mike Scifres’ foot. Five plays later, Palmer found Gresham from 3 yards out and a 7-0 lead. After the teams exchanged punts, the Chargers suffered another setback when back Mike Tolbert fumbled, setting up the Bengals at the Charger 33-yard line. Tolbert suffered a neck injury on the play in which he collided with Bengals safety Reggie Nelson. The Bengals could not capitalize however, as Chargers backer Kevin Burnett stoned Cedric Benson on fourth-and-one from the San Diego 24. After another Chargers punt, the Bengals were able to put together an 8-play, 59-yard drive that ended with Palmer’s 10-yard zip to Jerome Simpson. San Diego challenged the call, but the replay showed that Simpson got both feet down with possession. 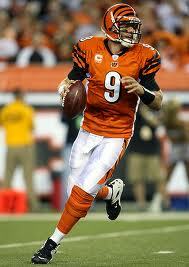 Clint Stitser’s extra point attempt sailed wide left and the Bengals came away from the drive up 13-0. The Chargers were again stuffed by Cincy’s ragtag defense, and Scifres was able to pin the Bengals inside their own 10. A 44-yard bomb from Palmer to Andre Caldwell got the Bengals in business at the San Diego 20, but Benson fumbled giving the Chargers new life with just over seven minutes to go in the third. The Chargers would use the final minutes of the first half struggling to get a score. It appeared they got the break they needed when CB Johnathan Joseph was called for defensive pass interference in the end zone, giving San Diego a first-and-goal from the one yard line with 3:08 to go. But the scrappy defense, that’s been maligned all year for being gashed in the run game stiffened, and three straight runs were stopped for -1 yards. The Chargers would kick a 20-yard field goal and head to the locker room down 13-3. The Bengals would get the ball first in the second half, driving to the San Diego 40 before having to punt. The Chargers would quickly capitalize with the ball, as rookie RB Ryan Mathews was able to find a crease and scurry 23 yards for a touchdown, trimming Cincy’s lead to 13-10. The Bengals again drove into Chargers territory but were forced to punt. The Chargers looked to take control, but that’s when another young Bengal would step up. Rey Maualuga, who may be the starting middle linebacker next year, stepped in front of Chargers TE Randy McMichael to intercept Rivers. 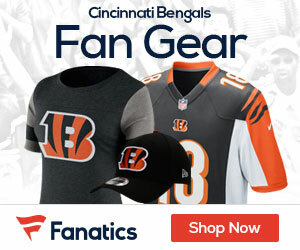 His 47-yard return set up the Bengals at the Chargers 21 yard line as the third quarter came to a close. Three plays later, Palmer rifled a pass to Shipley who pushed over the goal line and the Bengals had breathing room again at 20-10. The Chargers quickly took the kickoff and moved to the Bengals 10 yard line before having to settle for Nate Kaeding’s 28-yard boot and a 20-13 Bengals lead. Then the game broke open. On Cincinnati’s next possession, Palmer caught the Charger defense disoriented and slow in communicating their calls. He barked for a quick snap from shotgun formation, and Simpson ran past Avon Cason who was not set. Simpson caught the 59-yard strike giving the Bengals a 2-touchdown lead at 27-13. The Chargers number 1 offense was again stoned on their next possession, and with less than 6 minutes to go, Norv Turner decided to go for it on fourth-and-7 from his own 26. Rivers’ pass to Vincent Jackson was deflected at the line of scrimmage by DT Geno Atkins, giving the Bengals the ball in field goal range. Three plays later, Bernard Scott dashed 10-yards for a touchdown and the route was on at 34-13. Former Bengal Kelley Washington would score for the Chargers in garbage time, but their fate was already sealed. The Bengals head to the last game of the season facing a Ravens squad in need of a win for any chance at the division crown and a first-round bye. With Marvin Lewis’ future in doubt, look for more of the youth movement next week. As fans, we’ll get another look at the youngsters who may very well be the guys the team leans on in 2011. For one day at least, the kids did alright. Here’s to youth being served in the Queen City.